PHE is working with community substance misuse treatment providers in seven areas in England to deliver a ground-breaking randomised controlled trial (RCT) of an innovative, specialist form of employment support – Individual Placement and Support (IPS). IPS involves intensive, personalised support, a rapid job search followed, for those who secure employment, by in-work support made available to both the employee and the employer. IPS was developed with people affected by severe and enduring mental ill health, a sector where it has solid evidence for being more effective than more conventional forms of employment support. If the trial is successful, and IPS is found to be both effective and cost effective for this group of people, it could have a transformative impact on the way that employment support influences treatment and recovery in this country. This post provides an overview of the background to the trial, as well as some early and emerging learning. For many years now it has been an aim of successive governments to support people to go from substance misuse treatment into paid employment. There are good reasons for this; employment is associated with improved treatment outcomes as well as a range of other personal gains, such as greater independence, financial resilience and new social networks. All of these gains can strengthen the benefits of treatment for an individual long after the treatment ends. Some areas have seen some excellent outcomes but overall there has been little increase in the number of people moving from treatment into employment. In 2016, Dame Carol Black carried out an Independent review into the impact on employment outcomes of drug or alcohol addiction and obesity, which made a number of recommendations aimed at increasing the number of people able to move from treatment to paid employment. One recommendation was to conduct a large-scale RCT of IPS, which has been used in a small number of substance misuse services with promising results, but not so far with enough evidence to make the case for wider availability. The IPS for alcohol and drug dependence (IPS-AD) RCT is intended to test the IPS approach in community treatment for substance misuse - the first time a trial of this sort and scale has been attempted with this client group. PHE, backed by funding from the Government Work and Health Unit, is now working with partners in seven local authorities to deliver the trial: Birmingham, Blackpool, Brighton and Hove, Derbyshire, Haringey, Sheffield and Staffordshire. The IPS-AD sites provide a broad mix of characteristics – town and city; urban and rural; high deprivation and lower deprivation. The results attained by these seven sites will feed into analysis which will form the basis for future policy and service provision – evidence-based policymaking in action. 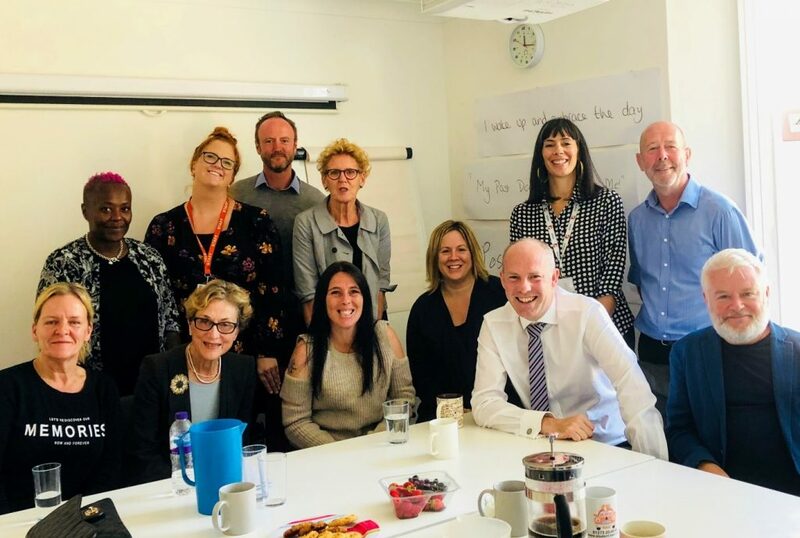 In late 2018, Dame Carol visited every IPS-AD site to learn about the progress of the trial, speaking to participants, IPS specialists, treatment providers, local authority commissioners and employers who have recruited staff via the IPS services. She was accompanied on the visit to Brighton & Hove by Justin Tomlinson, the Minister for Family Support, Housing and Child Maintenance. Dame Carol Black visits Oasis in Brighton and Hove, one of the services participating in the IPS-AD trial. Accompanying her is Justin Tomlinson MP, Minister for Family Support, Housing and Child Maintenance at DWP. Also present are representatives from Cranstoun, the lead member of the Pavilions treatment partnership, Brighton & Hove Council and Public Health England. "Moving back into work isn’t just about job security – getting a job brings a whole range of benefits and can be a significant turning point in someone’s recovery. It’s been tremendously encouraging to see how government funding is supporting the impressive work being done in Brighton to help people move into employment and start to rebuild their lives." "What struck me at each site is the commitment and enthusiasm of those involved, from commissioners to treatment providers to the IPS teams and IPS participants themselves. Most of the IPS specialists are new to working in substance misuse treatment, and for many of them IPS is a new way of working. They’ve adapted quickly and are completely focussed on supporting people into jobs that they enjoy. Above all, visiting the sites also meant I could meet some of the people who’ve already benefited from being helped into work, some of whom haven’t had a job for many years. With the ongoing support of their IPS specialists, this can be the beginning of sustained and positive change." The trial opened to recruitment in May 2018, and is scheduled to run until March 2020 with the results expected to be published in 2021.